Your local plumbers for over 100 years! 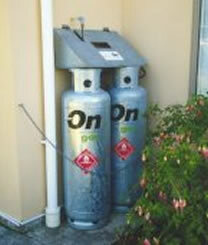 Both 45kg cylinders on a home are turned on by the delivery driver when they are delivered. Your system will only use one at a time. When the first cylinder empties, the system will automatically start using the second cylinder and the green (or clear) indicator will turn red. The indicator mechanism works on pressure, but our cold mornings drop the pressure in cylinders, which can give a false red indicator until the day warms up. We suggest that checking your indicator should only be done in the afternoon during winter. Check your indicator regularly, and phone Arthur Cates Limited on 308-5397 when it turns red. We will then exchange your empty cylinder for a full one. It’s that easy. Mid Canterbury is divided into separate delivery areas. Monday’s and Thursday’s we go from Ashburton to Mt Somers, Alford Forest, Methven, Barrhill, Rakaia, Fairton and everywhere in between. Tuesday’s and Friday’s we deliver between the Ashburton and Rangitata Rivers, including Tinwald. We deliver around Ashburton itself Monday to Friday. In the event that you require gas outside of normal delivery cycles (and we can get there) a call out fee of $50-00 will be charged. Please ensure we have clear access for the sack barrow to reach the cylinder station. At your place, most gas appliances do use a small amount of power to start heaters and run fans. When you have a power cut, you can run your heater or water heater from a car battery, using an inverter between the car (or any 12 volt battery) and gas appliance. These inverters are available from our Burnett Street branch. Please feel free to contact us, if you have any queries about our products, services or pricing.